The NuVue Pop-UP Greenhouse can allow you to start the growing season off right by providing protection from harsh weather conditions in the spring allowing you to get a jump start on the growing season. Size is 28" Wide X 30" High and comes complete with 4 ground spikes to secure to the ground. Provides protection from strong winds, heavy rain, overnight frost, insects and other pests while allowing the sun's light to warm the soil and accelerate the growing process for a lush, healthy plant. Pops open and stows flat in the off season. Reusable year after year! 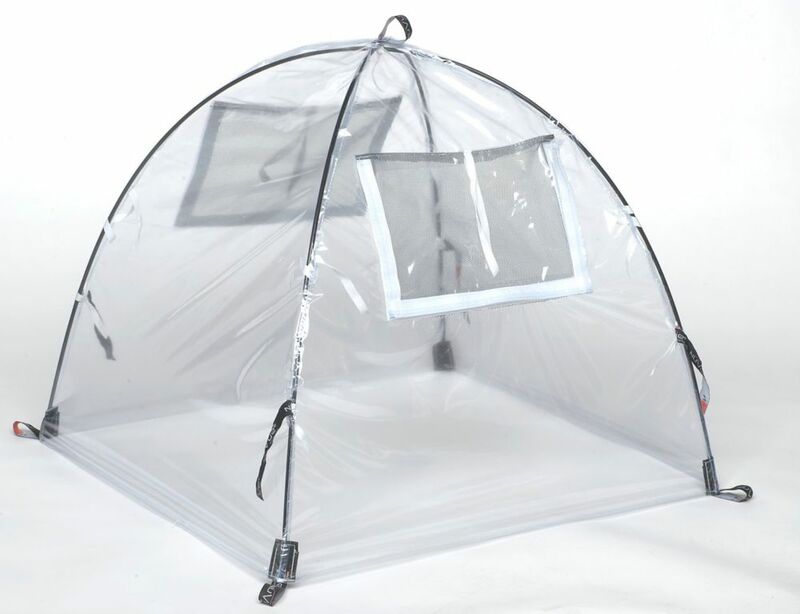 28-inch Pop-Up Greenhouse The NuVue Pop-UP Greenhouse can allow you to start the growing season off right by providing protection from harsh weather conditions in the spring allowing you to get a jump start on the growing season. Size is 28" Wide X 30" High and comes complete with 4 ground spikes to secure to the ground. Provides protection from strong winds, heavy rain, overnight frost, insects and other pests while allowing the sun's light to warm the soil and accelerate the growing process for a lush, healthy plant. 28-inch Pop-Up Greenhouse is rated 4.4 out of 5 by 5. Rated 5 out of 5 by gerkin from My plants love it! It was great for my spring seedlings. I used it on my deck and the dome kept the plants from the cool air. When the weather got sunnier I'd remove it in the daytime and put it on at night. It works great, folds up easily. I liked it so much I bought 2 more this year. Next spring I'll try using one in the garden (they come with stakes to hold the dome down). I love them! Rated 4 out of 5 by mimi from Good purches I have had this product for 3 years . Did a great job in cold weather for baby plants. The only problem was , the transparent plastic cover did not last more than 3 years. Considering the low price , it's worth it. I purchased 5 more greenhouse this year. Rated 5 out of 5 by Buckeye from Everything was provided to make this a very easy setup. It is working perfect and very easy to mo... Everything was provided to make this a very easy setup. It is working perfect and very easy to move when I need to get most of the day sun. Withstood heavy wind and rain. Rated 4 out of 5 by Aaronwai4191 from Great features! Nice case and feels solid Light weight - herb garden is growing well because of this green house. Like the latches on the side that allow fresh air to get in. Rated 4 out of 5 by Pbchi from It is neatly perfect for protecting and starting the bare... It is neatly perfect for protecting and starting the bare root rises I am growing. I could use a bit more room and height within it but overall is doing just what I needed .